Here’s a good news for the travel lovers. The World’s largest residence inn is going to open in Calgary, reportedly! 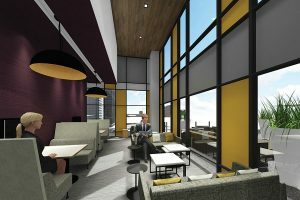 Marriott International, Inc. has announced the highly anticipated opening of Residence Inn Calgary Downtown/Beltline District, the largest property in the brand’s global portfolio. The Residence Inn Calgary marks the 800th hotel for the brand. With properties located in the United States, Canada, Europe, the Middle East, and Central America, Residence Inn is the global leader in the longer-stays lodging segment. Located in one of the city’s most dynamic neighborhoods, the Residence Inn Calgary Downtown/Beltline District was thoughtfully-designed to capture the unconventional charm of the city. Standing 33 stories high, the property features 390 well-appointed spacious suites, offering unbeatable views of the city, all while blending comfort and style. Built where the historic Alberta Boot Company once stood, the property stands out within Calgary’s iconic skyline and boasts unique design elements from floor-to-ceiling murals to cowboy boot stitching incorporated into all guestroom bed headboards, paying homage to Calgary’s western history. Steps away from the center of downtown Calgary, the property’s prime location offers guests close access to some of the city’s main attractions, including the Scotiabank Saddledome, Calgary Tower, and Studio Bell. Catering to both business and leisure travelers, the property’s studio and one-bedroom suites feature dedicated living and sleeping areas as well as fully-equipped kitchens, enabling guests to maximize their stay. Guests can enjoy additional amenities including complimentary grocery delivery service and daily hot breakfast, 24-hour market, a common laundry room, 24-hour, bi-level state-of-the-art fitness facility, market, and valet parking. For guests seeking a full-service dining experience, the property’s Lounge and Terrace offers light meals complemented by regionally-infused crafted cocktails, west-coast wines and local beer selections. 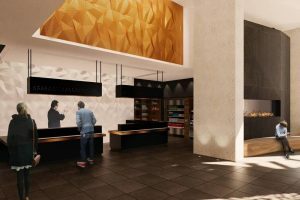 Just in time for summer, the property will soon be unveiling a wine bar in its lobby.